I’ve really enjoyed each issue of Avenging Spider-Man, especially with Chris Yost at the helm. 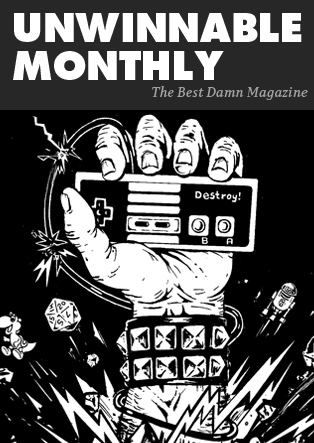 This month’s issue, however, is far short of Yost’s usual output. While it features the Punisher, his role in the story is minimal, and when Yost starts throwing in a few other villains, the result is a comic that lacks a centralized focus and instead meanders from scene to scene in a rather disjointed fashion. The one positive about Avenging Spider-Man #22 is David Lopez’s art. There’s a fineness to the visuals, one that makes the images crystal clear and smooth. 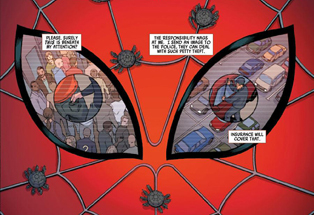 Even in the moments where we get inside Otto’s Spider-Man mask, Lopez finds a way to communicate the story without losing the sharpness in his designs. The same can be said of his action sequences. Otto battles Mysterio, Punisher and Hobgoblin in this issue, so Lopez has his work cut out for him. But he shows up ready to impress and the result is a comic with awesome clarity, even when its story fails to be as good. The reason is that the story is a bit too jumbled. Punisher’s impetus for wanting to kill Mysterio is never really stated, and while Yost refers back to Spider-Man’s killing of Massacre in Grand Central Station, we’re never really given a conversation between Punisher and Spidey about the incident, at least one that shares Frank Castle’s violent tendencies and the ways they consume him. He mentions to Spider-Man that when you cross a line and kill someone, you can’t come back, but there’s no real impact in this statement. It’s said as he runs away from a fight. While Avenging Spider-Man has been playing with the mystery of Otto collecting his old Sinister Six foes and keeping them trapped in containment units in some secret lair, this issue of the series goes off on a tangent, and unfortunately the result isn’t very good. While David Lopez delivers on some impressive art, the story fails to reach the same level of greatness. Hopefully, Yost can turn it around and get back to business next month. We’ve seen origin stories before. Hell, DC had a whole reboot shaped on creating new origins for its characters. So while Scott Snyder isn’t necessarily treading new ground with his “Zero Year” arc, he’s definitely trying to show how Gotham needed Batman, and how Bruce Wayne came to understand that he needed to embrace his heritage. A lot of Snyder’s work has centered on history — he began with Gates of Gotham, moved onto “The Court of Owls,” and is now backing up to give the in-between. We’re seeing Bruce develop into Batman, but from several different perspectives. We’ve already come with the “established” view, we’re shown a Gotham overrun by crime, then we’re brought back before the city fell; finally, we’re shown Bruce as a little boy, before he discovered the cave under his house and before his parents died. For all of its viewpoints, the comic never loses its thread. 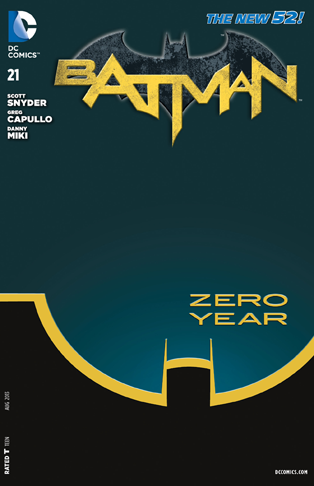 This is due to strong writing by Snyder, who finds ways to mesh his timelines through connective dialogue and interconnected plot lines. There’s the usual wink and nod to the origins of iconic Batman gadgets and visuals (like the giant penny), but the story is more concerned with giving readers a different view of Batman’s beginnings. Snyder’s definitely walking in the shadow of those who have tried and succeeded to do the same before (I’d be remiss not to at least mention Frank Miller’s seminal Batman: Year One), but this is a different writer and a different focus, and it succeeds. Greg Capullo is, as usual, fantastic in his art. He’s part of the reason the comic is so seamless. Capullo draws a much younger Bruce to help readers follow the thread, and he has a bit sparser style than usual. He eschews a lot of background detail and relies instead on white space, but to dramatic effect. Danny Miki’s inks are also responsible for this clarity of style as the images are much more refined than usual, and the panels much sharper for it. After the way Snyder opens the comic, with Gotham in disarray (for example, the subways are underwater), I’m curious to see how Batman will restore the city to greatness. We know it happens; we have the luxury of seeing this world from a perch in the distant future. But there’s a lot of work to do. But if Scott Snyder has proven one thing, it’s that he knows how to write a damn good Batman story, and this is more evidence of that fact. Bannen’s Book of the Week: I love Superman. I love everything about Superman. The character, unfortunately, has suffered from editorial malaise for a very long time. I mean, how do you write the story of a god living among mortals? But this isn’t any type of god — this is a god who is perfect in every sense of the word. He doesn’t suffer from issues of morality or conscience, he has no dark tendencies, and he looks for the best in everyone whom he encounters. So how do you make him interesting? You hire Scott Snyder to write him. Superman Unchained isn’t a home run. It’s a bit disjointed in its pacing and transitions, but it’s a damn solid book, and it offers readers a glimpse of the kind of character Superman could be, especially in the capable hands of Scott Snyder and Jim Lee. The story begins with a bit of history, tying in the bombings of Hiroshima and Nagasaki. But we quickly learn that the way these events occurred is different than how we thought. Fast-forward to modern day, and we’re thrown right into the action as Superman spends his time stopping a bunch of satellites from falling into Earth. The action is intense, and Snyder goes out of his way to show just how powerful Superman is. In fact, I would say that Snyder makes him imposing as well as strong, and he’s not afraid to make big blue a little angry. We get a bit of time between Superman and Lex Luthor, but this is mostly set up for a future plot which we can only assume will have adverse affects on Kal-El. Snyder also includes a tiny bit of Clark Kent in this, but his time is only three pages of the entire comic. Snyder seems intent on establishing that this is Superman’s book, and while Lois and Jimmy appear, the story is clearly not concerned with them, at least not yet. As for the art? Jim Lee draws a spectacular Superman — I don’t think many people would argue with that. Lee uses fine pencils, and Scott Williams scales back on the cross-hatching for a much more detailed look. 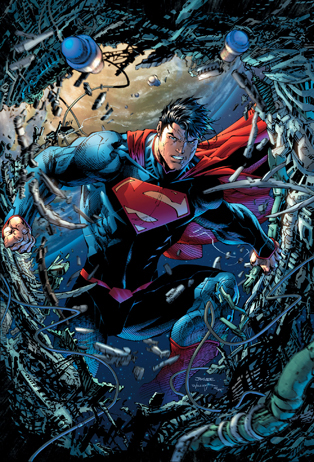 The comic includes a full-page pullout which really showcases Lee’s abilities as an artist, and coupled with Alex Sinclair’s colors, Superman Unchained is a visual triumph. Maybe I’m still on a high after viewing Man of Steel, but I loved this book. I feel like we’re finally getting a really good Superman story, and one that does justice to the character. This is the first step towards something great, and Scott Snyder deserves the accolades for this achievement.